Q. How to use iRelief Pro? Apply iRelief Pads to the appropriate acupoints or pain areas with 1 set or upto 4 sets of iRelief cables. You may refer to the wisdom book for usage suggestion of specific treatment. Turn the level knob to the lowest level. Switch on iRelief Pro, then turn the level knob clockwise to the the highest level which the user still feels comfortable. Higher level will be beneficial to achieve the result quickly and effectively. The user may feel the area under iRelief Pads have a slightly tingling sensation and vibration. Q. Is iRelief Pro useful to every body? A. iRelief Pro is suitable almost for every one. For people with heart problems, pacemaker users, pregnant women, toddlers, cancer patients and frail people, please consult medical advice before use. Q. How often can I use my iRelief Pro? A. Your usage depends on one's personal needs. iRelief Pro is completely safe and has no side effect. The regular use of iRelief Pro will help to strengthen the body microcirculation, enhance immunity and promote metabolism. iRelief Pro effectively relieves various kinds of pain and other chronic diseases, long-term pain may require a longer recovery time. Each treatment cycle is 20 minutes. You can apply multiple cycles in a day subject to your needs. Q. How long can I expect the changes after using the iRelief Pro? A. 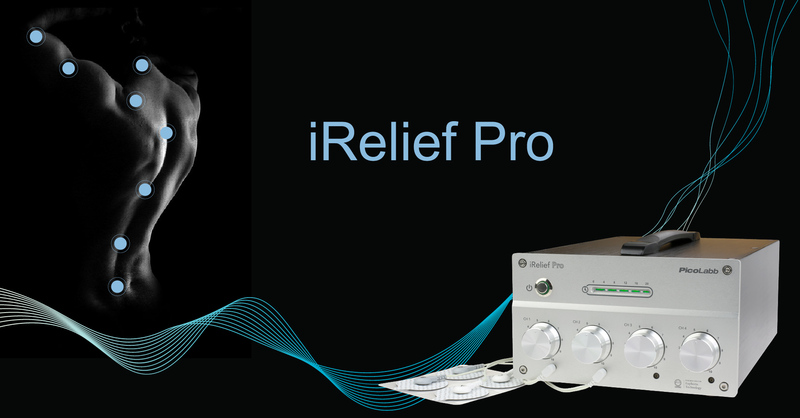 The iRelief Pro effectively relieves most symptomatic pain in 10-15 minutes. For long term pain or chronic diseases, the relief cycle may take more time. Q. Does the Pico Technology create any negative effect[s]? A. Not at all. The Pico Technology used in iRelief Pro enhances the optimal level of Qi (i.e. energy of life in Chinese medicine) in the body through the skin and acupoints. This positive outcome of improved circulation can be clearly observed under the microscope. Q. Can I use iRelief Pro on or near my head at night? A. It’s not recommended to use on the acupoints of the head or shoulders for pain relief in the evening. Some people find it hard to sleep due to accelerated blood circulation in these areas. Q. How can I maximize the use of iRelief Pads? A. Here a few tips to prolong the useful life of the pads. Clean the application area using rubbing alcohol or soap & water to remove oil on the application area before applying the pads. Use the pad handle to avoid damage to the gel underneath of the pads; pull off slowly after use. Stick the pads to the transparent protective sheet after each use. Q. What if I have an itchy feeling or skin redness at the application area? A. Some users may feel itchy and have slight redness at the application area when applying iRelief Pro. This is a normal result of enhanced blood circulation in the application area. This symptom will disappear in a short while. Q. Any cautions when using iRelief Pro? Do not apply iRelief pads to the application areas with sensitive infected skin or wounds. It is not effective to put the pads to areas covered with hair as the gel pads are not easy to stick firmly. Remove metal objects (watch, bracelet, buckle or necklace) that is near the iRelief Pads. Do not overlap iRelief Pads. iRelief Pro only operates with iRelief Pads. Do not use other brands of electrode pads. People with heart problems, pacemakers, pregnant women, cancer patients, toddlers and frail people should seek medical advice before use. Q. How does iRelief Pro affect microcircualtion? A. In Traditional Chinese Medicine, blocked meridian flow or impeded microcirculation will manifest into pain or illness. The protons in the body fluids and tissues cells all vibrate in random motions, microcircualtion becomes weak and slow. This is poor microcirculation, the delivery of nutrients and removal of metabolic wastes are conducted inefficiently. iRelief Pro simulates the acupoints by combining Pico Technology with electric current to achieve the needle free acupuncture. Therefore, the vibration of protons of body fluids and tissue cells will be aligned; and the body microcirculation and metabolism become faster and stronger. The re-established meridian flow will result in a good microciruation. The body’s innate healing potential is maximized to optimize the recovery and ultimately restore health. Q. Is it normal if I feel more painful in the pain area after applying iRelief Pro? A. The thoery of Chinese medicine says: 'Wherever there is blockage of Qi, there is pain. When Qi flows properly, pain disappears.' An illness is considered in 5 stages based on the severity - from initial stage of “itch”, and move progressively to “ache”, “pain”, “numbness” and “lack of feeling” in the worst situation. During the recovery process, iRelief helps to strengthen microcirculation to reverse the illness from the worst situation back to early healthy condition. This is a natural response during the recovery period that some users might experience. Q. How iRelief Pro is different from the other TENS device? A. The TENS devices are primarily designed for massage function, and would provide a temporary pain relief in some cases. iRelief Pro uses our unique Pico Technology with iRelief Pads to target the acupoints automatically and accurately to allow the effective non-invasive treatment to the meridians. The treatment effect is immiediate and apparent to relieve various kinds of pain and chronic diseases. Q. How to use iRelief? 1. Apply iRelief Pads to the appropriate acupoints or pain areas with 1 set or 2 sets of iRelief cable. You may refer to the wisdom book for usage suggestion of specific treatment. 2. Turn the level knob to the lowest level. 3. Switch on iRelief, then turn the level knob clockwise to the the highest level which the user still feels comfortable. Higher level will be beneficial to achieve the result quickly and effectively. 4. The user may feel the area under iRelief Pads have a slightly tingling sensation and vibration. Q. Is iRelief useful to every body? iRelief is suitable almost for every one. For people with heart problems, pacemaker users, pregnant women, toddlers, cancer patients and frail people, please consult medical advice before use. Q. How often can I use my iRelief? Your usage depends on one's personal needs. iRelief is completely safe and no side effect. The regular use of iRelief will help to strengthen the body microcirculation, enhance immunity and promote metabolism. iRelief effectively relieves various kinds of pain and other chronic diseases, long-term pain may require a longer recovery time. Each treatment cycle is 20 minutes. You can apply multiple cycles in a day subject to your needs. Q. How long can I expect the changes after using the iRelief ? The iRelief effectively relieves most symptomatic pain in 10-15 minutes. For long term pain or chronic diseases, the relief cycle may take more time. Q. Does the PVA Field create any negative effect[s]? Not at all. The PVA Field used in iRelief enhances the optimal level of Qi (i.e. energy of life in Chinese medicine) in the body through the skin and acupoints. This positive outcome of improved circulation can be clearly observed under the microscope. Q. Can I use iRelief on or near my head at night? It’s not recommended to use on the acupoints of the head or shoulders for pain relief in the evening. Some people find it hard to sleep due to accelerated blood circulation in these areas. Here a few tips to prolong the useful life of the pads. 1. Clean the application area using rubbing alcohol or soap & water to remove oil on the application area before applying the pads. 2. Use the pad handle to avoid damage to the gel underneath of the pads; pull off slowly after use. 3. Stick the pads to the transparent protective sheet after each use. Some users may feel itchy and have slight redness at the application area when applying iRelief. This is normal result of enhanced blood circulation in the application area. This symptom will disappear in a short while. Q. Any cautions when using iRelief? 1. Do not apply iRelief pads to the application areas with sensitive infected skin or wounds. 2. It is not effective to put the pads to areas covered with hair as the gel pads are not easy to stick firmly. 3. Remove metal objects (watch, bracelet, buckle or necklace) that is near the iRelief Pads. 4. Do not overlap iRelief Pads. 5. iRelief only operates with iRelief Pads. Do not use other brands of electrode pads. 6. People with heart problems, pacemakers, pregnant women, cancer patients, toddlers and frail people should seek medical advice before use. Q. How does iRelief affect microcircualtion? In Traditional Chinese Medicine, blocked meridian flow or impeded microcirculation will manifest into pain or illness. The protons in the body fluids and tissues cells all vibrate in random motions, microcircualtion becomes weak and slow. This is poor microcirculation, the delivery of nutrients and removal of metabolic wastes are conducted inefficiently. iRelief simulates the acupoints by combining Euphoria TechnologyTM with microcurrent to achieve the needleless acupuncture. Therefore, the vibration of protons of body fluids and tissue cells will be aligned; and the body microcirculation and metabolism become faster and stronger. The re-established meridian flow will result in a good microciruation. The body’s innate healing potential is maximized to optimize the recovery and ultimately restore health. Q. Is it normal if I feel more painful in the pain area after applying iRelief? The thoery of Chinese medicine says: 'Wherever there is blockage of Qi, there is pain. When Qi flows properly, pain disappears.' An illness is considered in 5 stages based on the severity - from initial stage of “itch”, and move progressively to “ache”, “pain”, “numbness” and “lack of feeling” in the worst situation. During the recovery process, iRelief helps to strengthen microcirculation to reverse the illness from the worst situation back to early healthy condition. This is a natural response during the recovery period that some users might experience. Q. Can I use a rechargeable battery for the iRelief? No, you cannot. The iRelief uses two 1.5V D size batteries only. Do not use other type of battery or rechargeable battery as they are not compatible and may damage the unit. Q. Can I use the power adaptor and battery together? Yes. iRelief will automatically switch to the power adaptor to preserve the batteries unconsumed. Q. How iRelief is different from the other TENS device? The TENS devices are primarily designed for massage function, and would provide a temporary pain relief in some cases. iRelief uses our unique Euphoria Technology with iRelief Pads to target the acupoints automatically and accurately to allow the effective non-invasive treatment to the meridians. The treatment effect is immiediate and apparent to relieve various kinds of pain and chronic diseases. Q. How do I select between iRelief and iWand? What are the differences? A. iRelief is very effective on pain relief with greater effect and shorter recovery duration. iWand is a powerful and portable handheld non-invasive device with advantages over iRelief include contactless usage and applicable for all areas including infected skin, wounds and areas covered with hair. iWand can also expedites the skin's absorption of topical treatments.